Rustc Heart features Northern Michigan's Kelly Shively and Norm Hausler. Impressive harmonies of voice, instrument and spirit create a feeling of home. 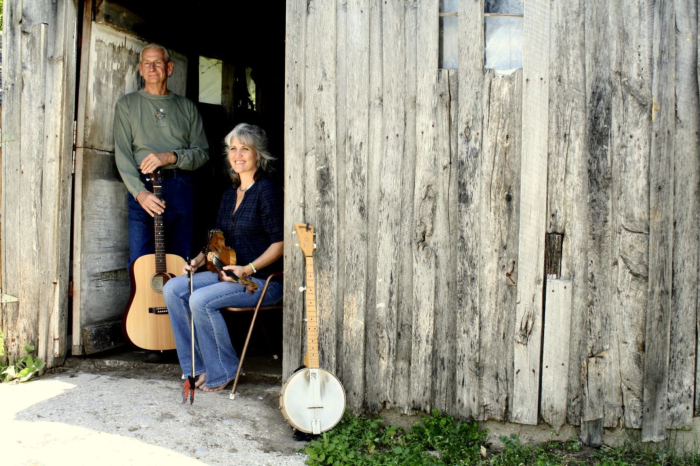 Kelly brings her songs of family and home and interpretations of traditional mountain music. Norm’s deep baritone voice lends itself to country classics and his own original songs. He plays guitar and Kelly plays fiddle, harp, banjo and more. Impressive harmonies of voice, instrument and spirit create a feeling of home when they play together. Kelly and Norm are seasoned musicians who have played in many groups and performed as solo singer/instrumentalists. These two Northern Michiganders have now combined their talents to form the duet, Rustic Heart. Kelly brings her original songs of family and home, along with her interpretations of traditional mountain music. Norm’s deep baritone voice lends itself to country classics and his own original songs. Norm is enjoying learning to accompany Kelly with “mountain modal” tunings on his guitar, while Kelly surprises with turns on her fiddle, harp, banjo and a variety of other instruments.